Pastor Harvey Burnett the Director of the Peoria Assn. 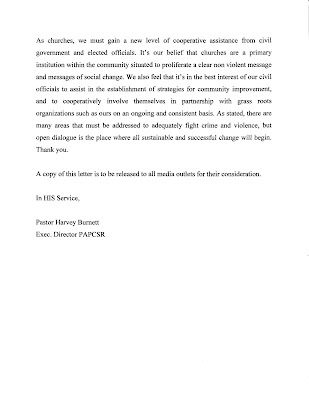 Of Pastors, has requested the development of ongoing meetings and strategy sessions between Police, City Officials, and Association members in an effort to build upon relationships created through the Peoria Gun exchange and create winning strategies to assist the community in its fight against crime and violence. 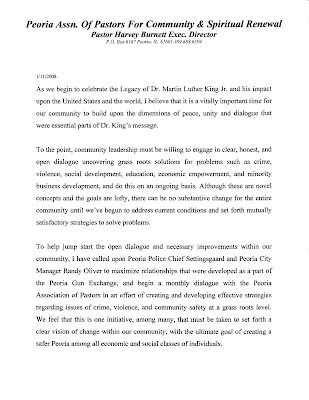 In an email addressed to Peoria Police Chief Setingsgaard and Peoria City Manager Randy Oliver the week of Jan. 1st 2008, Pastor Burnett requested the development of ongoing meetings to address crime at a grass roots level and to create ideas that are aimed at addressing social issues, curbing crime within neighborhoods, and creating positive relationships between the police and citizens. A meeting with Peoria Mayor Ardis has been scheduled for Tuesday Jan. 15th to discuss the issue.